These are the scenes of the rugged Southwestern US. They are unique, as the landscape itself is unique. Although the snow in Alpine Glory and in No Way Through seems strange to those unfamiliar with the Southwest, the territory extends from well below sea level to miles above it. In other scenes, the landscape seems on fire. In every case, the scenes are real, very real, and it is the art of digitography that has brought them alive. Be sure and check our other galleries; they each overlap a little. For your convenience, we've placed only a few images on each page of this gallery. When you are ready, go to pages 1, or 3 in this Gallery, or use the tags at the top to view other galleries on our site and place your order. Desert View©. Wait! Didn’t you see this scene in an old western movie? All it needs is a stage coach or a pony express rider. Here you are facing north from Lost Dutchman State Park across the Superstition mountains. The Dutchman ‘s gold was never found, but it doesn’t hurt to take a good look. Dove Mountain Springtime©. 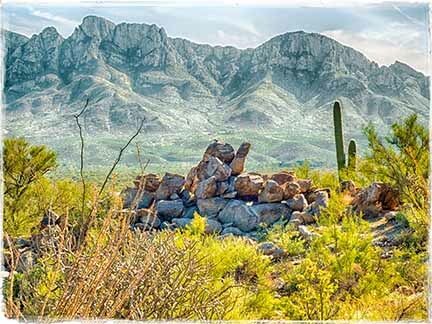 Wander an old Indian trail into the weathered granite cliffs of the Tortolita Mountains. Within an hour’s hike, ravines and washes of startlingly diverse color begin to appear. 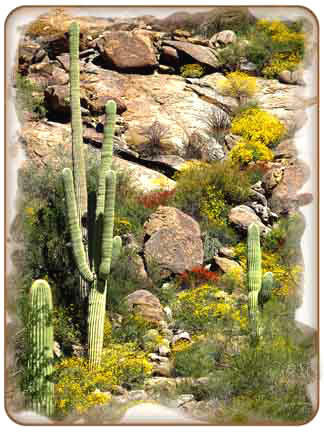 Nestled in the rocks are parches of bright gold Mexican poppies and flaming red Indian paintbrush. A little further on are a dozen of varieties of other seldom-seen wild flowers. Gnarly Plateau©. This colorful plateau is formed in the basin between two deep-cutting western rivers. 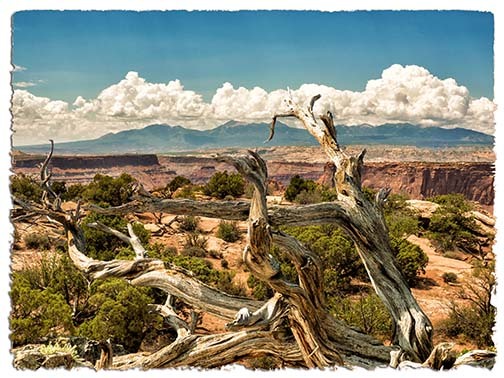 The desert land between mountain ranges seems dry and rocky, but it is just right for gnarly twisted juniper. The twists seem to be the result of the desert winds; here we can imagine the direction of that wind toward the left…or is it just imagination on this beautiful day? 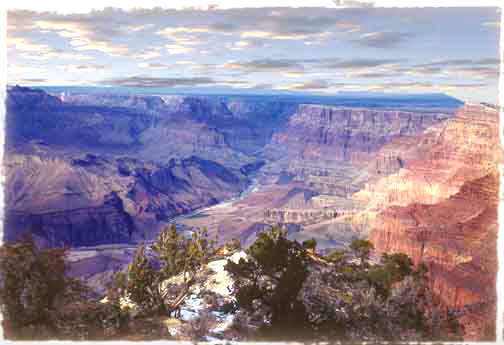 Grand Canyon©. Edge of the canyon. Still a little snow up here in the crisp early spring weather well over a mile above the river rushing below. Sky is dappled with an approaching weather front. Button your jacket and enjoy the soft colors of the scene before they fade in the oncoming evening light. Majestic Catalinas©. There they are, rising to over 9,000 feet, an island of amazing wildlife and vegetation in the midst of the Sonoran Desert. This lovely view of the Catalinas is from the edge of Honeybee Canyon, looking across the valley. And while we take it in, the overlook is also enjoyed by a tiny ground squirrel perched at the very top of the rocky cairn. Moon Watch©. The Harris hawks of Southern Arizona enjoy taking advantage of their ability to perch atop the giant saguaros while they scout for a morsel scurrying across the desert floor. Mornings and evenings are the best times because that’s when the wildlife most enjoy the desert temperatures. Here the moon has not yet set and the early sun lights up the chest of this sharp-eyed hawk.